Aric Almirola celebrates in Victory Lane after winning the 1000Bulbs.com 500 NASCAR Cup Series auto race at Talladega Superspeedway, Sunday in Talladega, Ala.
TALLADEGA, Ala. (AP) — Aric Almirola capped an absolute Stewart-Haas Racing rout at Talladega Superspeedway with an overtime victory that earned him an automatic berth into the third round of NASCAR’s playoffs. Now the race was going to overtime, and the SHR cars didn’t have enough gas for the extra laps. 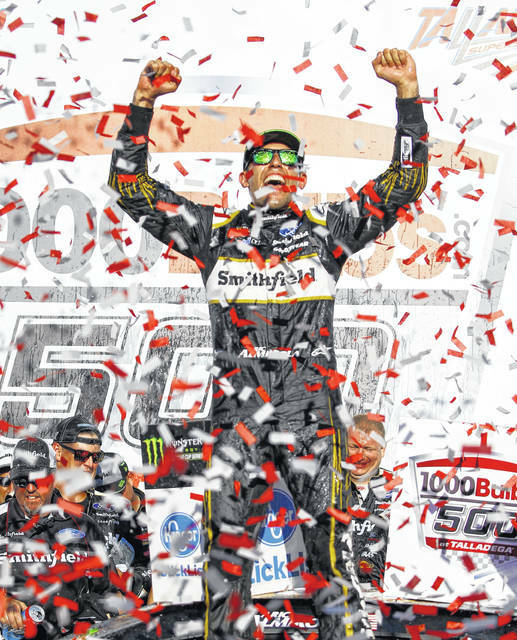 https://www.limaohio.com/wp-content/uploads/sites/54/2018/10/web1_NASCARRR.jpgAric Almirola celebrates in Victory Lane after winning the 1000Bulbs.com 500 NASCAR Cup Series auto race at Talladega Superspeedway, Sunday in Talladega, Ala.